I have cautioned the overuse of WebMD. But for basic info that won’t scare me, I am OK with it. For this particular definition, I am ok with it. Cerebral palsy. There are lots of stereotypical ideas about CP – wheelchairs all around, non-verbal, blind. Unfortunately, those are the realities of many individuals who live with CP. But they aren’t everyone’s. The doctor reading your X-ray may have CP, your bank teller may have CP, your kid’s soccer coach may have CP – and you may never know. As I have come to understand, CP can be a diagnosis that means everything, or that can mean next to nothing. “Level of involvement,” severity and coupling disabilities change the scope of things. So does prognosis and the need for access to supports and therapies. Baby Jude was lucky to get an early diagnosis of CP. That meant early treatment and therapy. It also meant that we could (and still do) allow the boy to simply develop and see what he can “shake off” symptom-wise as his developmental delays gain momentum. It’s hard to delineate if an issue is CP, developmental disability, visual, sensory, hemiparesis (weakness on one side), etc. Sometimes I just don’t know, so I fall back on the umbrella diagnosis of CP. Major assets in moving Jude along in his physical development are our access to therapies (PT, OT, Speech) at Akron Children’s Hospital and Summit DD (formerly Summit MRDD), and use of equipment. At Summit DD, Jude gets to use a stander – it holds him in, forces him to use muscles his CP, hemiparesis and delays haven’t quite woken up yet. He has access to a gait trainer to practice reciprocal movement with his feet. Same with at Akron Children’s – amazing. Equipment and adaptations for home use can be essential – and pricey. I researched, asked advice, Googled. 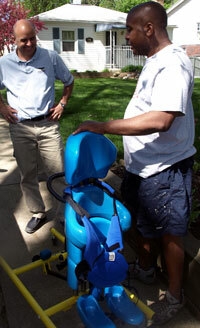 We were on every non-profit lending library waiting list in Ohio and surrounding states to borrow a stander. I scoured Craig’s List and eBay – no dice. Then I got an email. Ohio Assistive Technology located a stander for us to borrow. Jack pot! The downside – it was in Columbus. Doesn’t seem like a huge deal to jump on 71S and get to CBUS, right? But with Jude’s appointments and Vance working the hours he does, that simple jaunt to grab the loaner stander seemed insurmountable. Here is where the neighborhood village comes into play. Our dear friend and neighbor, Steve, travels to Columbus routinely. We asked a favor (unfortunately for our friends and family, we are no longer above asking for favors). 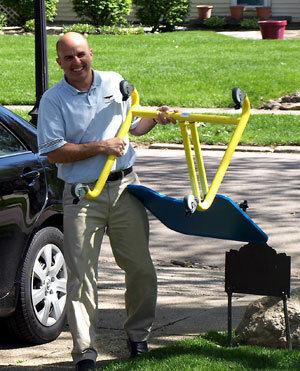 After a long day of work, Steve took the time to go pick up the stander for Baby Jude. And he delivered it with a smile. We still owe him and his family dinner. He definitely missed his family meal that evening to help us out. Cerebral palsy, like every other diagnosis, brings with it inherent needs. For Baby Jude, his mild level of CP brings with it a need to simply train his muscles, loosen his core, allow gravity to develop his bone and muscles. A stander is helpful for all of that and more. Luckily, for Baby Jude, we have a friend and neighbor like Steve who was more than willing to jump into Jude’s village and bring our kid a stander. All the way from Columbus.